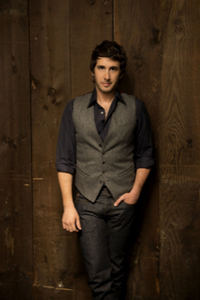 With his sixth album, All That Echoes, Josh Groban has at once built on the touchstone artistry that has made him a global pop star for more than a decade and expanded his ambitious reach into richly rewarding new territory. The inspiring first single “Brave” shows off his accomplished, personal songwriting as one of seven songs on the album he co-wrote. And inspired choices of other’s songs, from the Academy Award-winning “Falling Slowly” from the movie and Tony Award- honored spin-off Broadway musical Once to Stevie Wonder’s “I Believe” through his continued explorations of the poetry of Spanish (“Un Alma Mas,” featuring Cuban-born trumpet great Arturo Sandoval) and Italian (“E Ti Prometterò,” a duet with Italian star Laura Pausini), spotlight his singular talents as a masterful interpreter.